2:21 I do think we hold up the rest of the day. I'm done for the day. Thanks for coming. See you next week. Take a course. one thing about the Moon flux lines. There are up and down flux lines. They tend to have up and down influences. and now are conjesting. Yesterday the flux lines were further apart, and set the first high and then the low. I covered my swing trade short. The separation between the up and down Moon flux gives you a clue about the type of day it might be. 11:02 we may now pull back into the second trade time. I'll try to be patient and wait. 10:23 the 440 EXMA was broken and is now curling up. 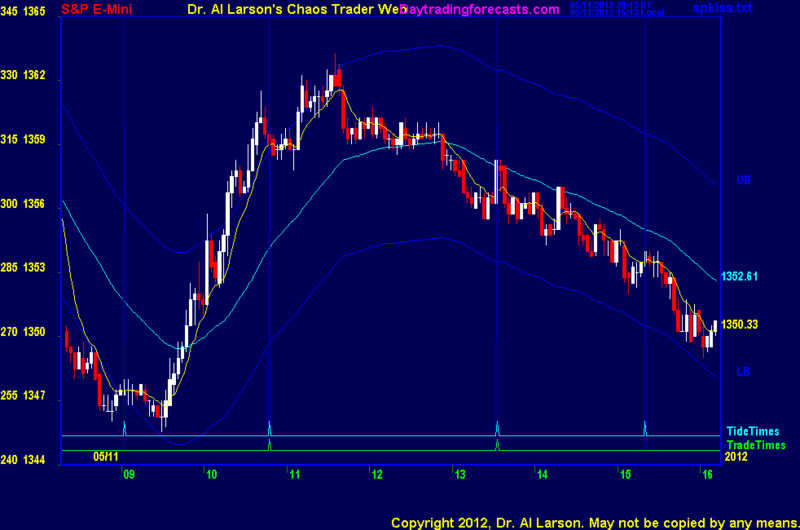 My down FOP has fractured, so we may be seing a longer term change in trend. 10:06 on the MTRainbow chart, prices bounced up to the white 440 EXMA. This acts as resistance. and the Hex Wheel tutorial, also linked on the right side of the list of charts page. 9:53 the Fractal of Pi is one of my favorite tools. I use it for day trading, swing trading, and position trading. The eMylar Fractal of Pi overlays help me be patient, since they show me future potential moves. 9:51 this is a "gap down" day. A common pattern is for a rally into about 11:00, then a continuation of the decline. 5/11/2012 1:52:46 PM MT BBB****:: It was hard to take while reading your comments (Not that I don't appreciate the clinic, I do), but took 5 on that one. Looks like we sell into close, but 5 was good enough. Have a good weekend. 5/11/2012 1:05:44 PM MT BBB****:: Sold 1356.50 on what I took to be a continutation sell at the trade time. holding with a tight stop here. 5/11/2012 8:43:09 AM MT BBB****:: I was set to buy at 9.15 around 1354 but was focused on my FOP chart so did not. 5/11/2012 8:39:09 AM MT BBB****:: WSL - just wait. You ain't seen nothing yet! 5/11/2012 8:37:13 AM MT WSL:: I am astounded with the result of this trading system. I am an Investor Business Daily trader. The result of your day-trade system sounds too good to be true. 5/11/2012 8:35:30 AM MT WSL:: This is the first time I join this website. Total newbie to this trading system. 5/11/2012 7:39:40 AM MT BBB****:: Al and CCTs - would love any feedback on my chart and comment in CCT room. Thank you. 5/11/2012 7:31:18 AM MT sdg:: Thank you sir, more than acceptable. 5/11/2012 7:14:12 AM MT BBB****:: Great swing trade Al. 5/11/2012 7:01:52 AM MT sdg:: Al or any ***'s: a trade management question. I notice you typically use 3-6 pts as initial stop, any stats on the risk/reward of the typical trade? Thanks. 5/11/2012 6:47:41 AM MT sdg:: Nice swing trade Al.